WiFi SPARK is delighted to announce the launch of its latest WiFi stadium solution in conjunction with Irish rugby club, Ulster. The WiFi solution installed in Kingspan Stadium by WiFi SPARK goes live on Saturday, providing a high-quality and robust user experience for Ulster’s supporters in time for their sold-out match against rivals Leinster. Ulster Rugby is one of four professional teams in Ireland who compete in the Guinness PRO12 Championship and the European Rugby Champions Cup. Kingspan stadium has an overall capacity of 18,200, with four fully covered terraced areas providing seating for up to 9,000 spectators. The state-of-the-art stadium is equipped to the highest standard including professional team facilities, a family area, corporate hospitality, a food village and world-class media suite. 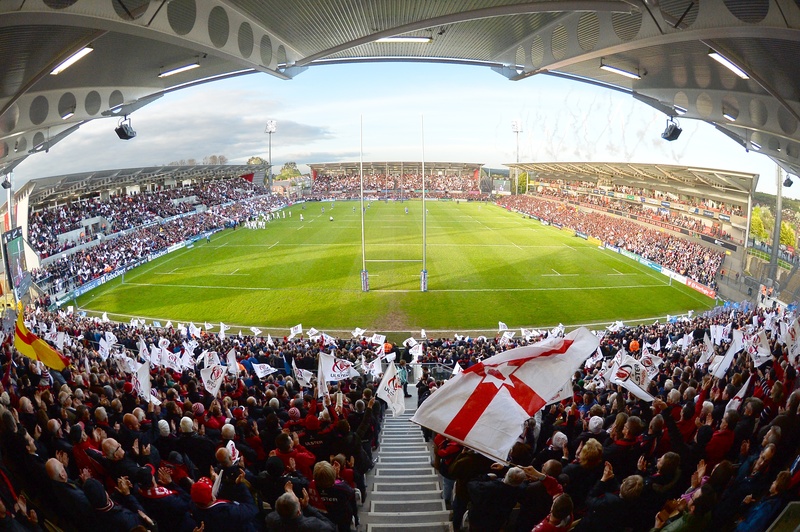 With top-level professional rugby taking place at the ground and matches broadcast globally, Ulster Rugby looked to WiFi SPARK to provide a fully managed and supported WiFi service that included a branded user experience portal, enhanced content filtering, bandwidth control, user data analytics and remote monitoring. The use of the innovative SPARK® system which collects and analyses user data will permit Ulster to better understand the needs and requirements of its supporters. This insight will not only allow the club to enhance services but enable them to secure further sponsorship deals and revenue which can be ploughed back into the club for the benefit of its patrons. Kingspan Stadium is the first stadium of its kind in Ireland to have this type of bespoke WiFi solution installed. Supporters will benefit from a fully branded user experience, access to key information on what’s happening in the stadium ahead of fixtures, and travel information to and from the stadium, as well as social media access throughout the grounds including during matches. WiFi SPARK’s experienced team of engineers has undertaken intricate installations across the globe and has a deep understanding of how the technology needs to be deployed in high-density, outdoor environments. Using this extensive knowledge and experience, WiFi SPARK deployed the WiFi access points in precise locations throughout the Kingspan Stadium for optimal coverage and minimal interference, without compromising pitch integrity. To cope with the sheer volume of supporters logging onto the WiFi at the stadium entrances, WiFi SPARK installed high-performance SPARK ® Gateways and high-density Ruckus Wireless technology, a proven combination. Each stand was simultaneously connected utilising a 10 Gigabit fibre backbone to the main gateways, providing high-density WiFi access throughout the stadium. Ulster Rugby is the latest notable organisation to benefit from WiFi SPARK’s class-leading infrastructure deployment service and SPARK® service delivery platform. The WiFi solution installed in Kingspan Stadium provides outstanding rates of customer engagement, while data collection and analytics yields an immediate return on investment. Overall, few other solutions on the market can come close to WiFi SPARK’s performance and reliability which offers exceptional peace of mind.